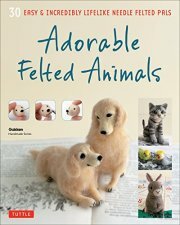 Create cute and realistic felted animals with this fun and easy-to-follow needle felting book. Nothing feels better than a cute, fuzzy animal you can hold in the palm of your hand. Adorable Felted Animals shows you how you can create more than 30 endearing dogs, cats, birds and other animals using a little wool roving, a felting needle, and a few simple techniques. Starting with basic shapes you roll in your hands, you can sculpt the most lifelike miniature animals, using your felting needle to join the individual parts and give them their firm and final shape. With little bits of contrasting wool you can give your felted friends expressions that are irresistible. It’s easy, creative, and very relaxing. 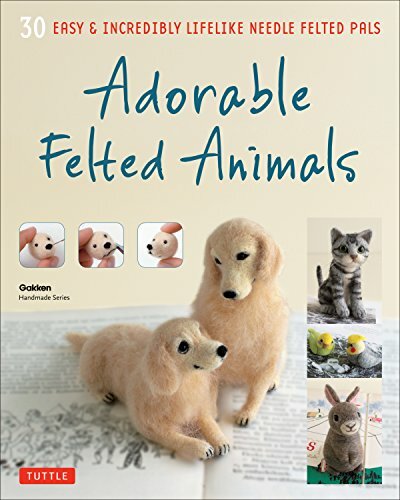 The animals range from about 2-4 inches high, and instructions are included for turning a few of your felt creations into fun dangly accessories. A full lesson takes you though one of the projects from beginning to end, covering all the basics to ensure that you have all the skills you need to make any critter you want.